Celebrity Cricket League 2017 T10 Blast (CCL 7) is schedule to be started on 24th December, 2017 and will be ended on 25th December, 2017. This time the informal CCL is consisted of two days only. There are total 6 teams taking part in this T20 format league. 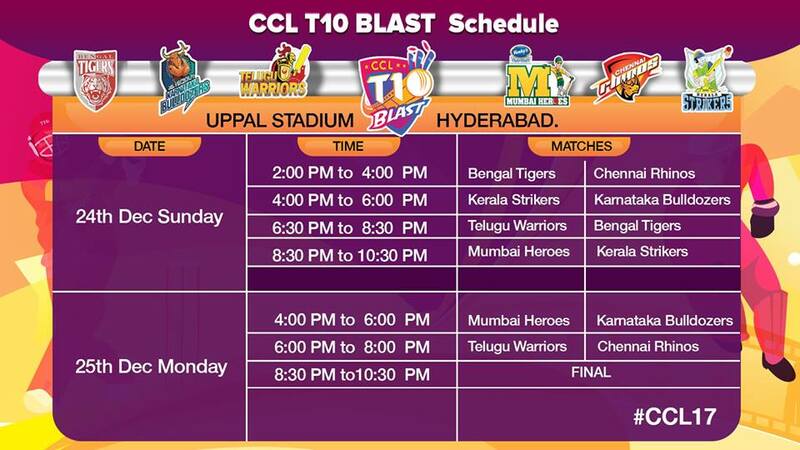 CCL 2017 time table is given details with Time, date and venue. The first match is scheduled to be played between Bengal Tigers and Chennai Rhinos at 02:00 PM local time and will be played at “Rajiv Gandhi Cricket Stadium Hyderabad”. 2nd match of the same event is scheduled to be played between Kerala Strimers and Karnataka Bulldozers on 24th December at 04:00 PM. 3rd game will be played between Bengal Tigers and Telugu Warriors on the same day at Rajiv Gandhi Stadium, Hyderabad at 06:30 PM. Mumbai Heroes will take on Kerala Strikers in the 4th match at 08:30 at Rajiv Gandhi Stadium. Celebrity Cricket League 2017 will witness 3 matches including final match. 5th match of match of CCL T10 Blast will be played between Mumbai Heroes and Karnataka Bulldozers at Rajiv Gandhi international cricket stadium Hyderabad. Telugu Warriors Vs Chennai, 6th match will be played between Telugu Warriors and Chennai Rhinos at 06:00 PM at Hyderabad.